Start getting involved in Small Business Saturday today! Small Business Saturday reaches millions of customers and businesses each year – you can get involved now! 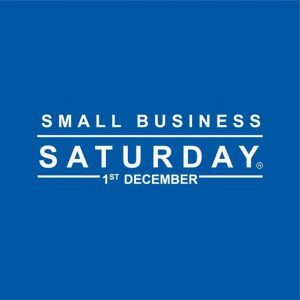 Small Business Saturday is back on the 1st December and this year it promises to be bigger and better than ever before! Small firms and micro-businesses from all over the UK can get involved – whether you’re a family business, local shop, online business, wholesaler, business service or small manufacturer. If you are a small business and you want to get involved, then you can do so in lots of different ways. Here you can register and advertise your business for free! The UK bus tour will take to the road again this year, travelling from one end of the country to another. The bus will play host to numerous activities, workshops and exhibitions that you can get involved with here. Every year, 100 small businesses are highlighted, one business for the 100 days leading up to the big event! The 100 businesses will receive numerous benefits and exposure which, in the past, has included a visit to Downing Street and a meeting with the Chancellor of the Exchequer. Make sure you have your information ready for the SmallBiz 100 application, which opens in June 2018. For more information including lots of social media tips, visit the Small Business Saturday website. For general enquiries, you can email the comms team. Keep up to date with what’s going on by following Small Business Saturday on Facebook, Instagram and Twitter using the hashtags #smallbizsatuk and #getinvolved. We will also be supporting the event across our social media channels so keep a look out and support the event by liking and sharing.